From a structural perspective, a waffle slab in a building is typically used for covering large spans without a column, and it can carry a heavier load than a flat slab. 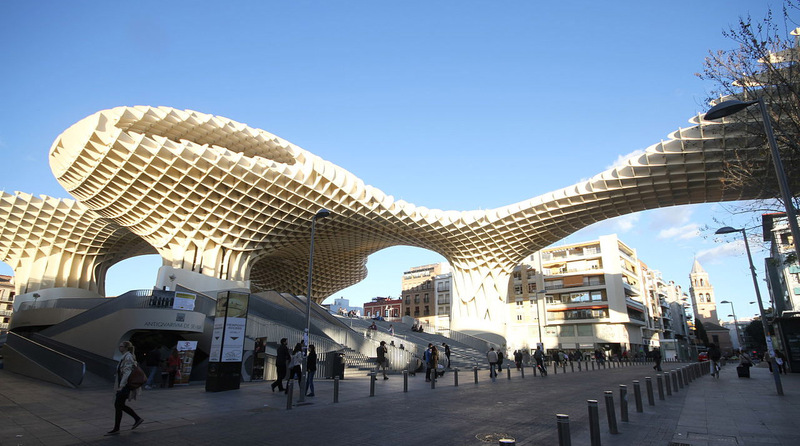 Over and above this, however, a waffle structure also lends itself to construct complex, organic forms much more easily than other types of structures, not just in architectural design (Figure 1) but also in industrial design (Figure 2). Figure 2. Use of a waffle structure in automotive design. This is a photo of a 1:3 physical prototype of the structure. To create a computer model of a waffle structure, any NURBS-capable application will work, but the application that is most commonly used is Rhino. 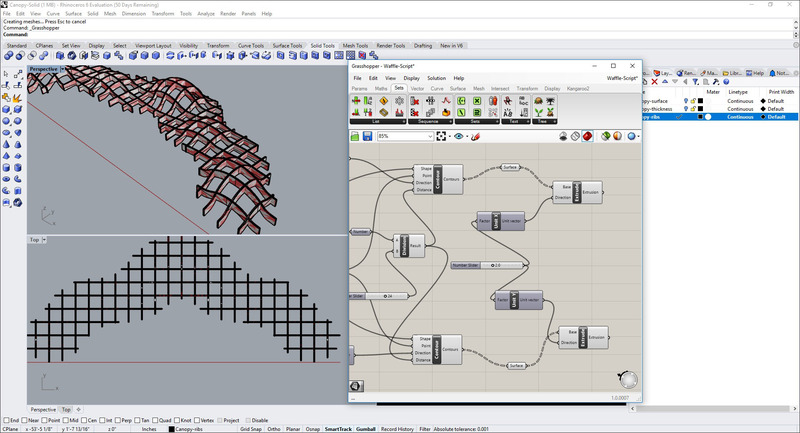 While the structure can be entirely modeled in Rhino, the use of Grasshopper—a graphical algorithm editor tightly integrated in Rhino—makes it much more powerful and allows design changes such as the spacing of the ribs and their thickness to be made much more quickly and easily. 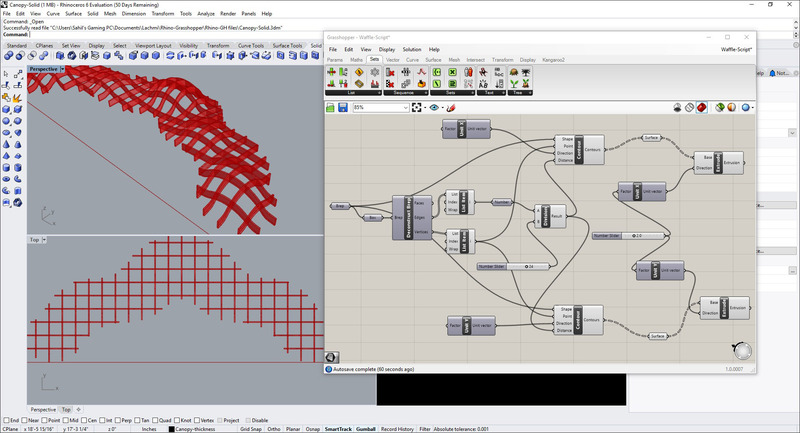 This tutorial walks you through the steps for modeling a waffle structure in Rhino using a Grasshopper script. It assumes some familiarity with Rhino and a basic knowledge of the Grasshopper interface. We will start by first modeling the waffle structure entirely in Rhino, showing how it is less forgiving of design changes as it requires a complete manual re-creation of the ribs of the structure every time a change is made. Figure 3 shows the massing model of a canopy design, the top of which we want to construct as a waffle structure. Figure 4 shows just the top surface which has been copied to a separate file. Figure 3. 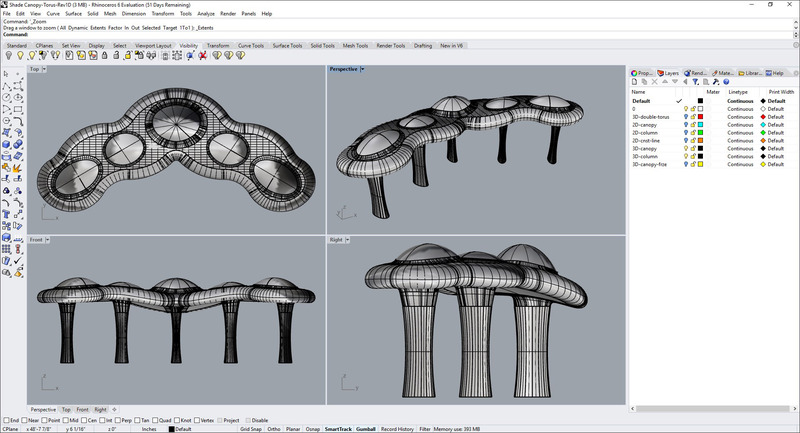 The massing model of a canopy design in Rhino. Figure 4. The top surface of the canopy has been isolated in a separate file. Next, the surface has to be given a thickness that is equal to the depth of the waffle structure. 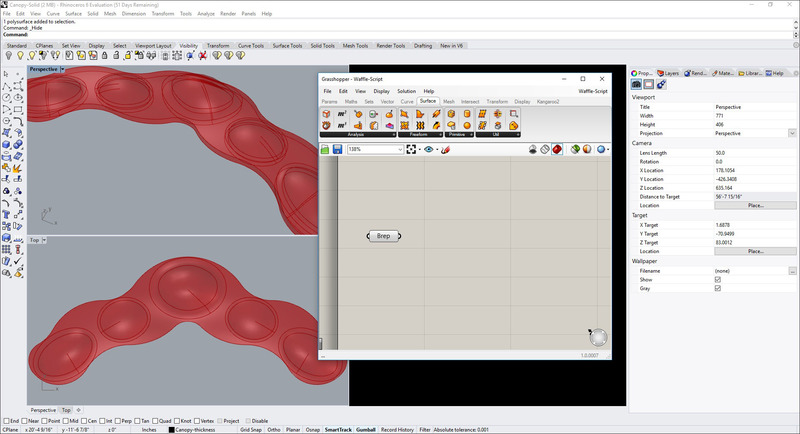 This can be done by creating a copy of the surface, using the Loft tool to connect the edges, and finally joining all the surfaces together to form one object (Figure 5). Figure 5. Providing a thickness to the canopy surface. 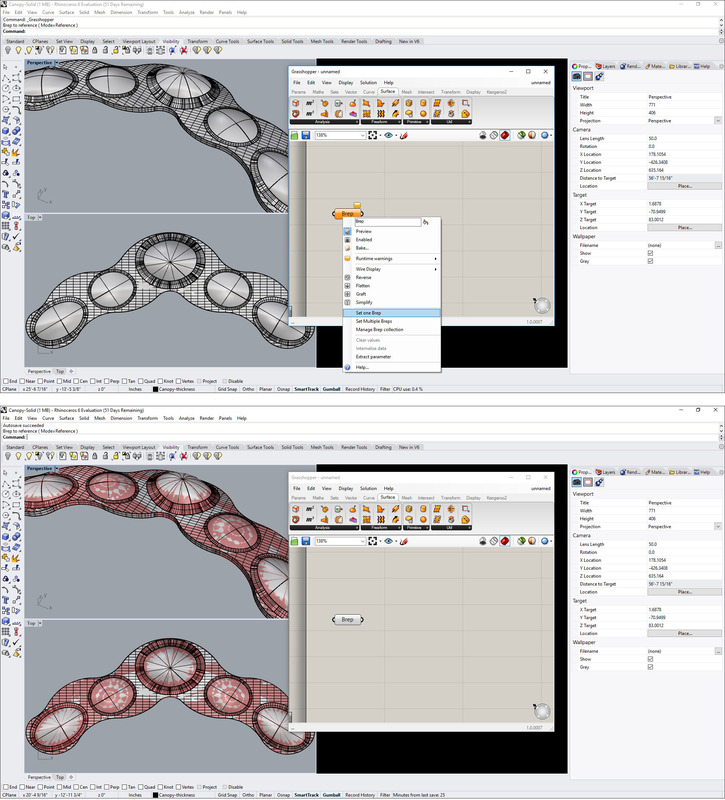 The next two images show the use of the Contour and Extrude commands in Rhino to create the ribs of the waffle structure at a specified spacing and using a specified thickness. Figure 6. Using the Contour command to cut sections through the model at a specified interval. Figure 7. 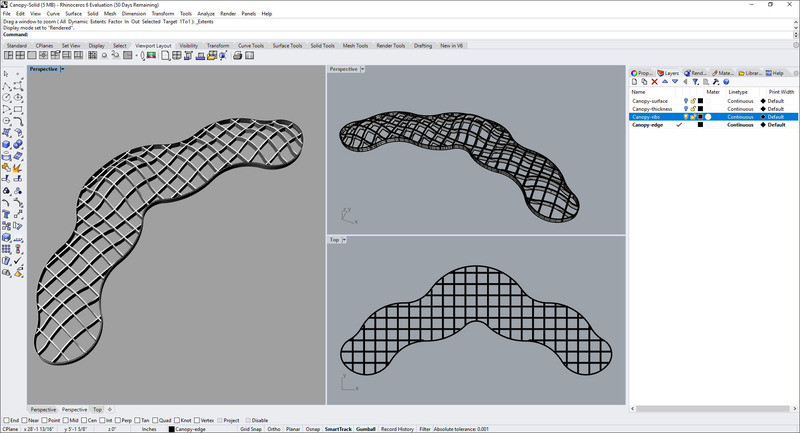 As the final step, all the individual contour curves as well as the edge curve have been extruded to create the waffle structure. While this may seem a perfectly good way to model a waffle structure in a 3D modeling application, we can achieve a lot more flexibility in the spacing of the ribs and their thickness using a Grasshopper script. The rest of this tutorial will demonstrate the step-by-step creation of the script. 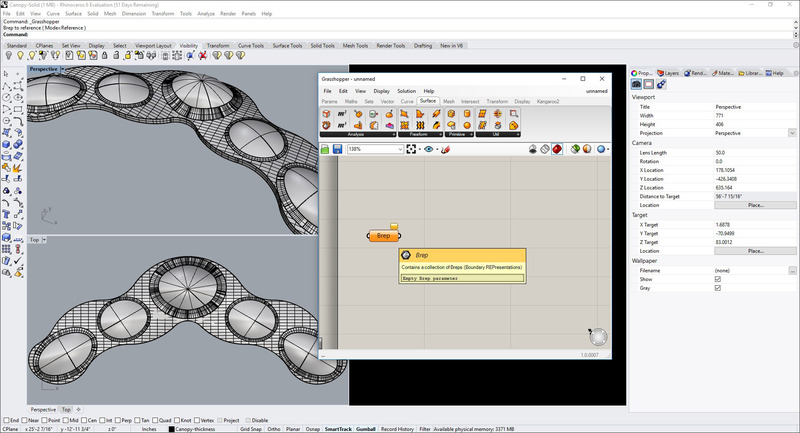 With the Rhino model of this canopy object open, go to the Tools menu and open Grasshopper. It will open in a separate window that is overlaid on the Rhino window. Start the script by creating a Brep (boundary representation) component. Figure 8. 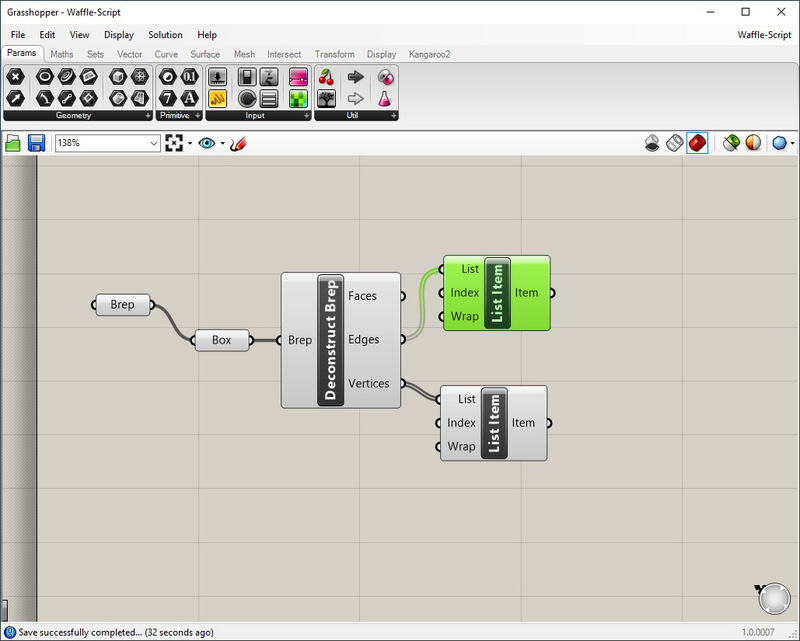 Creating a Brep component in Grasshopper. 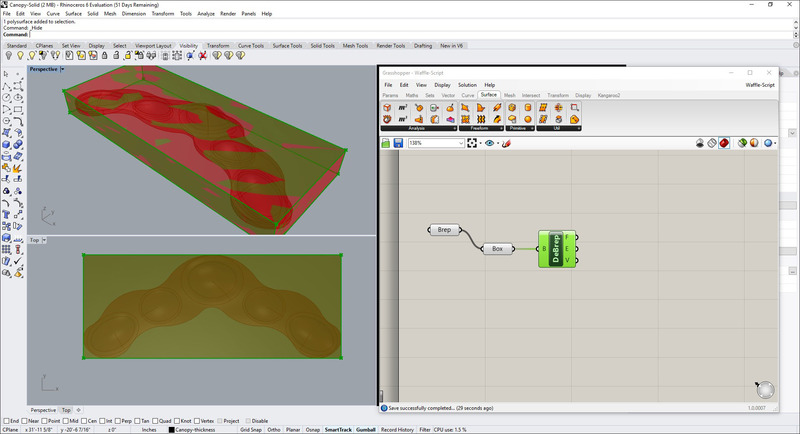 Connect this Brep component in Grasshopper to the canopy object in Rhino by selecting the Set one Brep command from the right-click menu and selecting the Rhino object. 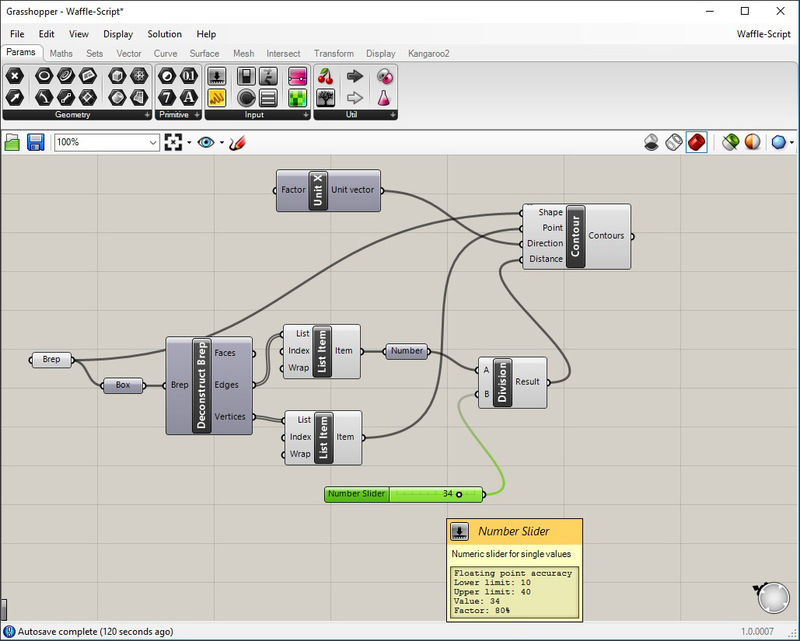 All the scripts connected to the Brep component in Grasshopper will now be applied to the selected Rhino object. So far, we have not created a script yet, so there is nothing to see except an indication that the Rhino object has been set as the Brep. Figure 9. Setting the canopy object in Rhino as the Brep of the Grasshopper script. Since the Grasshopper file is different from the Rhino file—which allows the script to be applied to multiple Rhino files and vice versa—make sure you save the script file. You can hide the Rhino object to make the results of the script more visible. Figure 10. Turning off the visibility of the canopy object in Rhino, which leaves only the Brep representation of the Grasshopper script visible. Continuing with the script, add the components Box and Deconstruct Brep (DeBrep) as shown, with the input going from the Brep to the Box and from the Box to the DeBrep. The Box component helps to define the direction of the ribs, while the DeBrep component breaks down the box surface to its constituents faces, edges, and vertices. Figure 11. Adding the Box and DeBrep components to the script and connecting them to the original Brep. 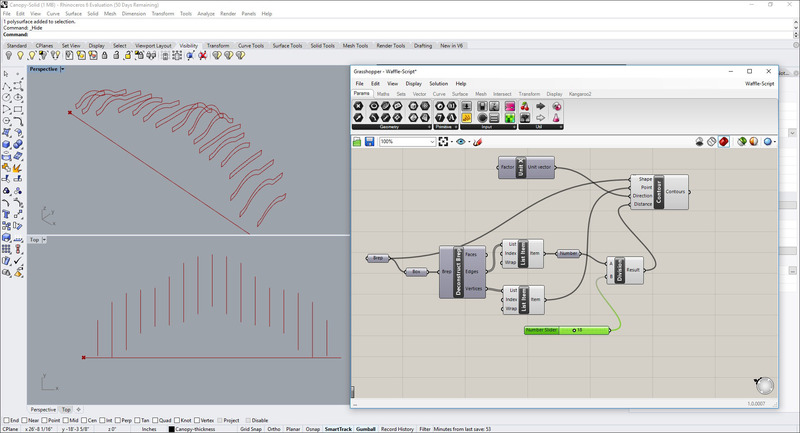 Selecting the DeBrep component in Grasshopper shows its representation in Rhino. As the next step, we will add two list items to capture the list of the edges and vertices of the DeBrep. There is no visible change to the model since no graphical command has been added to the script. Figure 12. Adding two List Item components, one for the edges and the other for the vertices of the deconstructed Brep. We now need to create the contours in each direction for the ribs of the waffle slab. The script for this involves multiple components. We will start by placing the Contour component, which needs four inputs: the original Brep for the shape; the List Item for the vertices as the points; an additional Unit X component to indicate the perpendicular direction (we are starting with the contours along the Y direction first); and the distance, which is derived by dividing the length of the DeBrep (captured by a Number component connected to the List Item for the edges) by the desired spacing, using a Division component and a Number Slider. Figure 13. 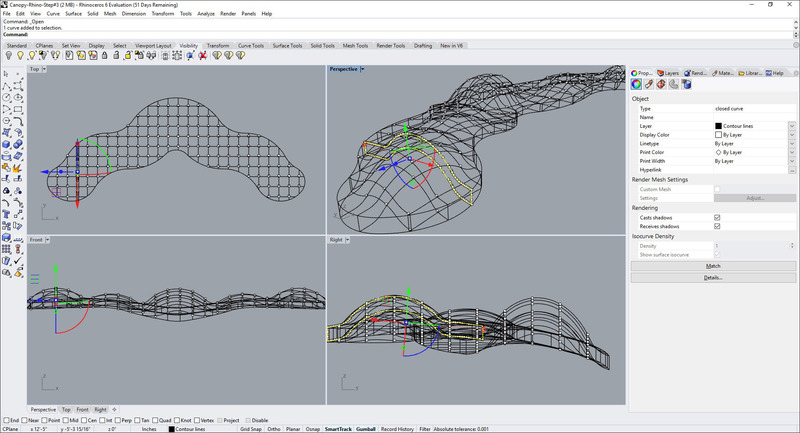 Adding more components to create the contours for the ribs of the waffle structure in one direction. If you now see the canopy object in Rhino to which this script is being applied, you can see the contours and how their spacing can be changed by simply adjusting the value in the Number Slider, whose minimum and maximum limits you can set as required. 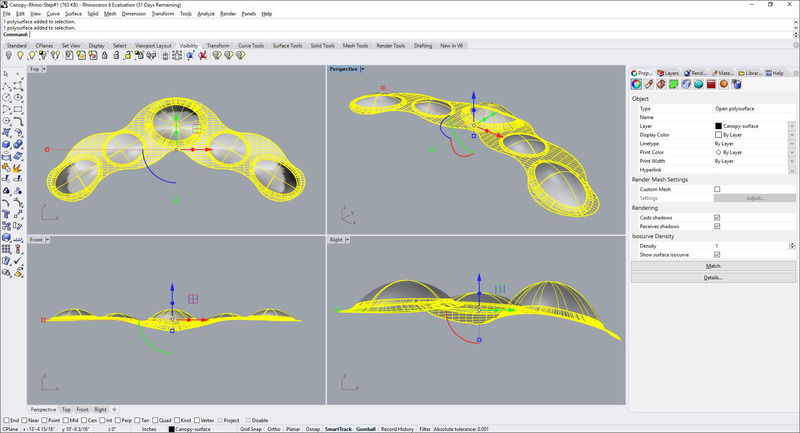 The Rhino display in Figure 14 was generated by turning off the visibility of the Rhino object as well as deactivating the preview of all the Grasshopper components except the contours. Figure 14. The contours generated by the Grasshopper script so far. We can now create another Contour component to create the ribs along the X direction. This requires creating a new Unit Y component. The other inputs are the same, assuming you want the same spacing for the ribs in both directions. If not, you would need to create another Division and Number Slider for the new contours. Figure 15. Adding a second Contour component to generate the rib surfaces in the perpendicular direction. Next, we want to give the contour surfaces a thickness. Since they are generated as curves, we will first convert them to surfaces using the Surface component. We can then use the Extrude component that uses the contour surfaces as input, and the distance of the extrusion in a specific direction, which in the case of this script, is provided by additional Unit X and Unit Y components for the two directions and a Number Slider for defining the width of the ribs. Again, the width can be adjusted by simply manipulating the value in the slider. Figure 16. Adding Extrude components in both directions to give a width to the contours. Once the spacing of the ribs and their thickness has been set as required using the Number Slider, we can transform the Grasshopper objects to actual Rhino objects by “baking” them. This involves selecting the two Extrude components and selecting Bake from the right-click menu. Among the different options in the dialog that comes up, you can choose the layer these ribs will be placed on. Figure 17 shows them placed on a separate layer in the Rhino model. Figure 17. 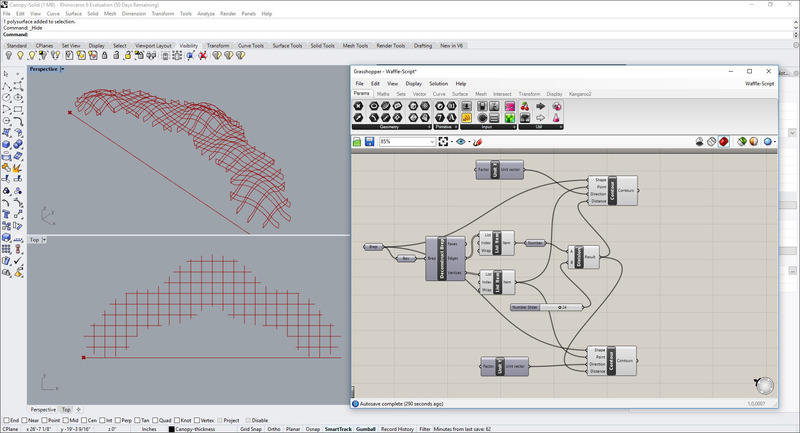 Adding the extruded ribs to the Rhino model from Grasshopper using a process called Bake. The ribs are placed in a separate layer. You can now turn off the Grasshopper window and complete the edge rib of the canopy in Rhino to have the waffle structure model. Figure 18. The completed model of the waffle structure in Rhino, including the waffle ribs that were generated from the Grasshopper script. 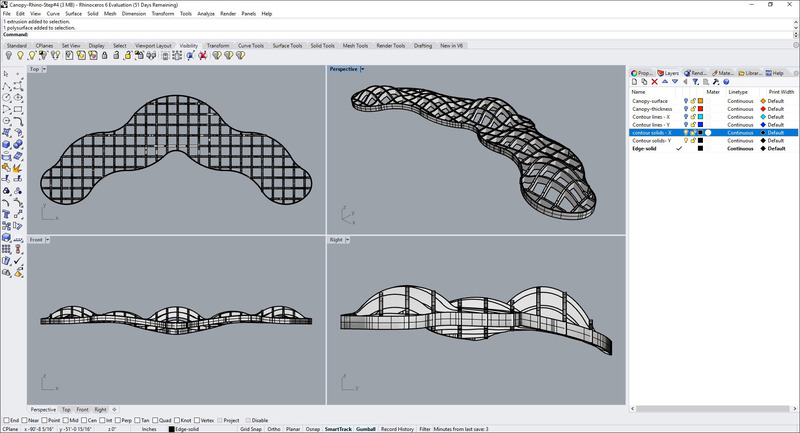 We can see that creating a Grasshopper script for a waffle structure takes more time than modeling it directly in Rhino, but it is well worth it—once the script is written, the design is automated and changes can be made instantaneously, allowing many different design options to be explored before finalizing on one. Also, once the script is created, it can be used on multiple projects. 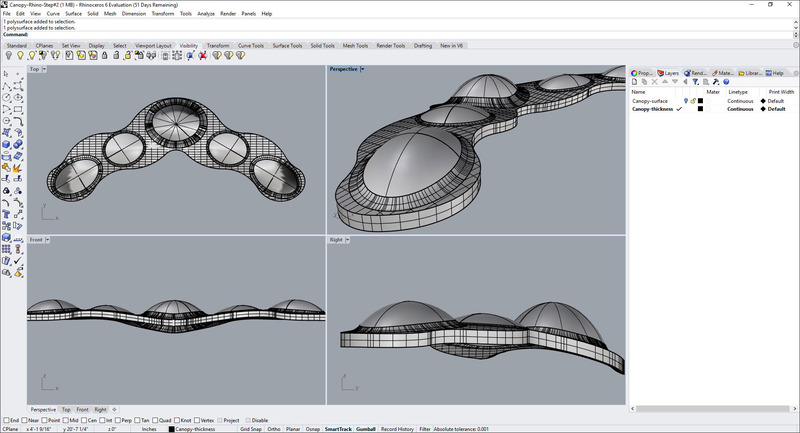 Similar to object libraries and CAD and BIM standards, an office can have an entire library of these scripts, ready to be applied to different Rhino models to explore different design forms for its projects. 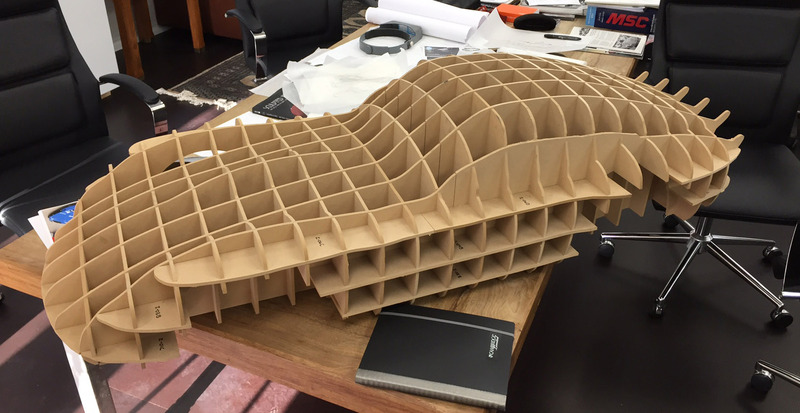 If a physical prototype of a waffle structure needs to be created, some additional steps are required—creating the notches in the ribs at the intersections and then unfolding them to the XY work plane for laser cutting by a CNC machine. The Grasshopper script that has been created so far can be further extended to automate this process as well. There is also a separate Grasshopper component called Bowerbird that can be used. The Grasshopper script created for the waffle structure in this tutorial can be downloaded here. 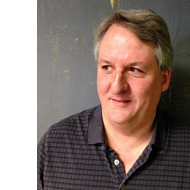 Mark Loomis is a Principal at MP Studio, a full-service landscape architecture studio located in San Antonio, Texas. He has 17 years of experience in the landscape architecture industry and 14 years of practice in the related fields of architectural stonework and precast concrete technical detailing. He has a keen interest in 3D modeling, parametric modeling and generative design. Interactive panoramas are a compelling web technology that gives the viewer a better sense of space compared to any static photo. This tutorial by architect and author, Scott Onstott, shows how easy it is to create this type of interactive experience starting with either a 3D model or a panoramic photo using Garden Gnome Software's Pano2VR image converter for Windows/Mac/Linux. Updates including Vectorworks Architect 2015, Newforma Project Center Eleventh Edition, form•Z 8, Vico Office R5, Dassault Systèmes "Façade Design for Fabrication" tool, and more. An overview of Graphisoft's BIMx app for iPad, Autodesk's new cloud strategy and the Autodesk Design Review app, the iVisit 3D app, and the Inception app from Architactile. In this article, Karen Kensek, Assistant Professor in USC's School of Architecture, advocates the writing and use of macros in AEC firms to improve the efficiency of BIM, which "out of the box" is not synchronized with the way firms work.